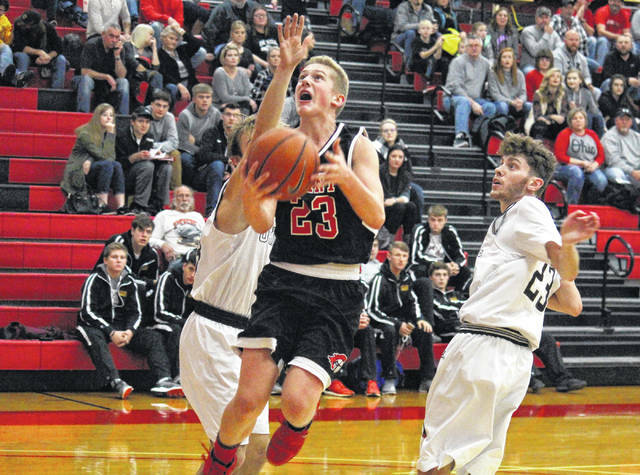 Point Pleasant freshman Hunter Bush (center) splits a pair of Oaks for a layup, during Oak Hill’s 78-39 victory on Saturday in Rio Grande, Ohio. Point Pleasant sophomore Camron Long (left) attempts a shot from the low post, during the first half of Oak Hill’s 78-39 victory on Saturday in Rio Grande, Ohio. RIO GRANDE, Ohio — Offense like that is hard to compete with. 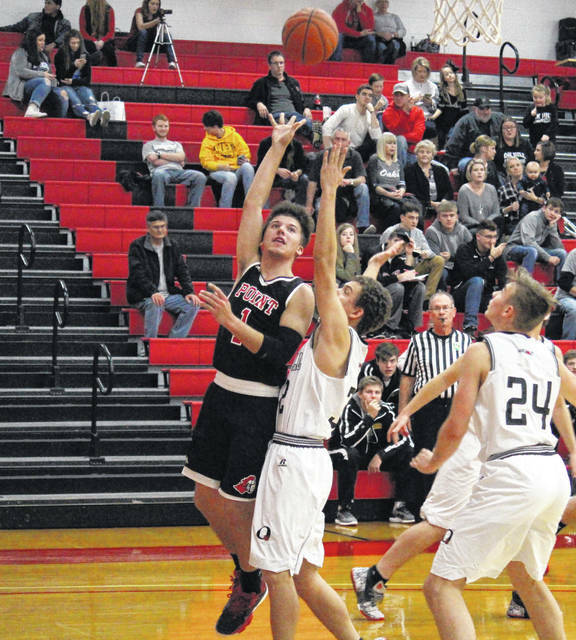 In the Newt Oliver Coaches Classic on Saturday in Gallia County, the Point Pleasant boys basketball team dropped a 78-39 decision to Oak Hill, which shot 65.9 percent from the field and had just five turnovers through the first three quarters of play. The Oaks (4-0) led wire-to-wire and jumped out to a 29-5 lead eight minutes in, hitting all-5 of their three-point attempts in the opening quarter. Oak Hill outscored Point Pleasant (0-2) by a 24-11 clip in the second quarter, making the margin 53-16 at the break. The Big Blacks’ best offensive quarter of the night was the third, in which they scored 15 points, while allowing Oak Hill to score 18. PPHS outscored the Jackson County natives by a 8-7 clip in the finale, making the final margin 78-39 in favor of the Oaks. “We knew coming in it was going to be a tough matchup for us,” sixth-year PPHS head coach Josh Williams said. “They’re well coached, they have a good program and they have good players 1-through-5. We knew it was going to be a great opportunity to evaluate ourselves. In total the Big Blacks shot 15-of-45 (33.3 percent) from the field, including 5-of-16 (31.3 percent) from three-point range. In the third period alone, PPHS shot 6-of-10 (60 percent) from the field, including 3-of-4 (75 percent) from deep. After not getting to the free throw line in the first three stanzas, PPHS hit 4-of-6 (66.7 percent) foul shots in the finale. The Oaks finished the game shooting 30-of-48 (62.5 percent) from the field, including 9-of-15 (60 percent) from deep. OHHS made 9-of-13 (69.2 percent) free throws in the victory. Oak Hill won the rebounding battle by a 27-19 count, including 6-to-5 on the offensive glass. OHHS also earned a 24-to-8 assists advantage and a 9-to-2 steals edge, while accounting all-4 of the game’s blocked shots. Point Pleasant turned the ball over 17 times in the contest, while the Oaks gave the ball away 10 times. PPHS freshman Hunter Bush led the charge for the Big Blacks, scoring 16 points, including a team-best six from long range. Braxton Yates scored nine points in the setback, Camron Long added five, while Malik Butler and Kade Oliver had three points apiece. PPHS senior Trace Derenberger marked two points, while Casey Lowery had one point to round out the team total. Oliver pulled in a team-best five rebounds for the Mason County school, while Derenberger came up with four boards. 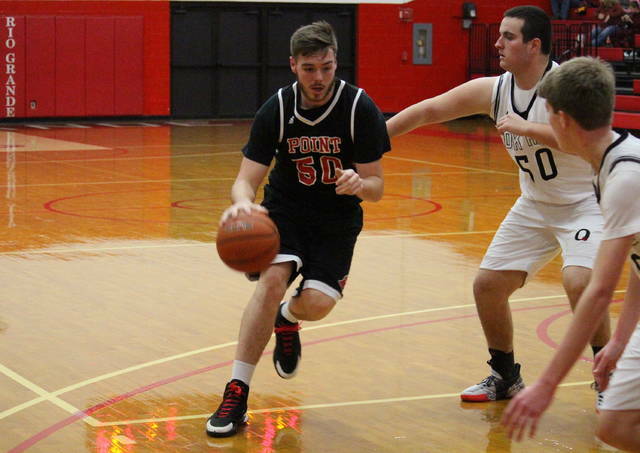 Butler and Yates had two assists apiece for PPHS, while Bush and Yates recorded one steal each. Mitchell Hale led the victors with 22 points, followed by Mason Darby with 20 and Landon Carroll with 16. Brett Long scored eight points, Drew Hanning and Chase Hammond chipped in with four apiece, while Nolan Carroll and Dalton Lewis finished with two each. Hammond led the Oaks on the glass with eight rebounds, followed by Long with six, while Landon Carroll had a game-high six assists. On defense, Long and Landon Carroll both recorded two steals and one rejection, while Nolan Carroll had one steal and two blocked shots. 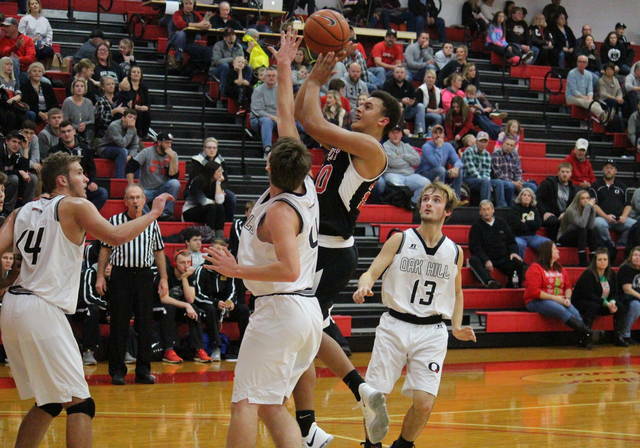 The Big Blacks won’t have a chance to avenge this setback, but will look for revenge from their season opening loss in their next game, as the Red, Black and White invade Poca on Dec. 19.